Sesame oil is used for Cooking, Body massage, Hair treatment, Food manufacture, Drug manufacture, Industrial uses. Sesame is the oldest ingredient for edible oil and originated from India. Currently, it is grown in China, Africa, South America, and North America. The main composition of sesame oil reduces cholesterol in our blood. The human body does not supply its own energy (Linolenic Acid) need, so we should take Linolenic Acid regularly to prevent adult diseases. Besides, it is effective for headache, stomach ache and nervousness. Since it contains oil, sesame also works well on constipation. Studies have shown that Sesame is good for the body as it protects major organs and activate metabolism; it controls the function of stomach and bowels, helps blood circulation, adds nutrients to the skin, and prevent grey hair. Gan Geok Eng Sesame Oil is pressed from organic sesame seeds. It is cold-pressed in small batches, in a state-of-the-art, low-heat, light- and oxygen-free environment, then nitrogen-flushed to maintain optimum freshness and prevent oxidation when bottled. 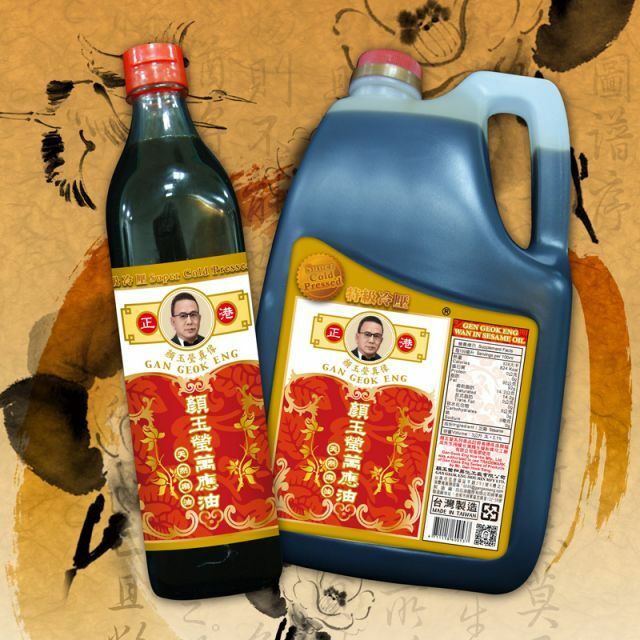 Gan Geok Eng Sesame Oil can be used for stir-frying and sauteing. It also adds a delicious light flavor to salad dressings.